I used to have half a dozen photographs of this crash. The fellow who sold me our plane sent them to me. He knows I am always thinking about walking away from a forced landing. This one was just so close to my nightmare scenario, with a dream outcome, that I would open the photos and look at them every now and then, especially when we were headed out for a longer trip. I am not sure what I did with them, all I can think is that I decided I was looking at them too often and I deleted them. So all the way back in 2007, just two years after we bought our plane, a pair of brothers went to Spanish Fork, Utah, and rented a Diamondstar. They each had their son along, so it was a lot like a flight I could take with my brother. They are just going to fly up to Vernal, Utah for the night and then back down in the morning. It’s about an hour flight along some very nice country. The next morning they were flying back and over the Strawberry Rese Reservoir. The pilot said his brother called out that he had seen an elk in “a draw,” which is a formation that most pilots would think of as a small box canyon. The pilot turned the plane into the canyon to take a look and instantly realized his mistake. He was already at 7,500 feet, where the plane doesn’t perform quite as well as at sea level. The canyon was too narrow to turn around in and the sides sloped too steeply to climb up out of it. 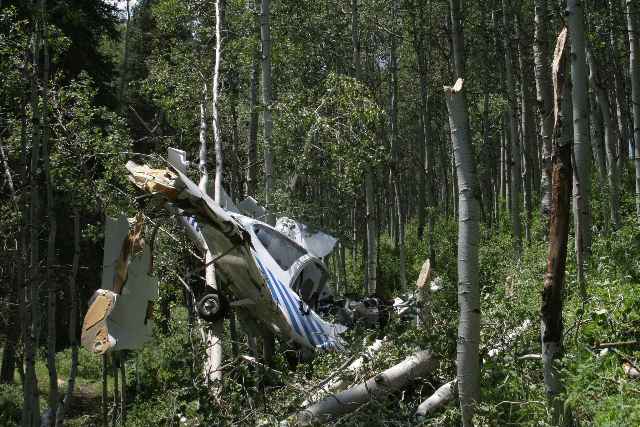 Knowing that he was out of options, the pilot slowed the plane down as much as possible and flew it into the wooded side of the canyon wall. The pilot was well-within the killing zone. He had 141 hours. At that point I had not yet started my instrument training and was being extremely cautious about every flight. He had only 14 hours in a Diamondstar. I doubt my brother could have gotten me to turn the plane off course with only fourteen hours in it. We did a few test flights to check engine performance when I first took delivery of the plane and I sweated the entire time, extremely aware of all of our options and outs if something went wrong. But if I had done the exact same thing, made the same mistake, I would like to imagine not being frozen by panic and doing all the right things. This pilot did all the right things. It was clearer in the other photos I have, but you can see that the egg-shaped enclosure around the passengers is intact, while the tail is broken off, the engine is shoved off of the firewall and the wings are snapped. Basically, to help keep the passenger compartment intact, the rest of the plane is sacrificed, absorbing the energy of the collision. I don’t want to test this myself, but knowing about how effective it is makes me feel better, especially about flying the family around in the plane. This entry was posted in Uncategorized and tagged crash, safety. Bookmark the permalink.